Today, we’d like to introduce you to Aunt Ruth — a New Yorker and a good neighbor. You may soon start seeing her at your favorite local coffee shop or bodega, printed on the side of your cup, or on a flyer distributed in your community. She is the new face of our campaign to raise awareness of homeowner scams. For the past three years we’ve worked in partnership with the New York State Attorney General’s Office to draw attention to this problem in our neighborhoods. Like many victims of scams in neighborhoods like Bed-Stuy, Brooklyn, and Jamaica, Queens, Aunt Ruth is “of a certain age.” You can call her a senior citizen, but don’t call her vulnerable or naive. She’s whip-smart, and knows the difference between what a legitimate housing organization can do to help a homeowner get out of mortgage distress, and what a scammer might do to swindle someone who turns to them for help. Aunt Ruth is here to stop the spread of misinformation and to help keep her neighbors safe. These cups give us a chance to reach people in a way that conventional advertising cannot. 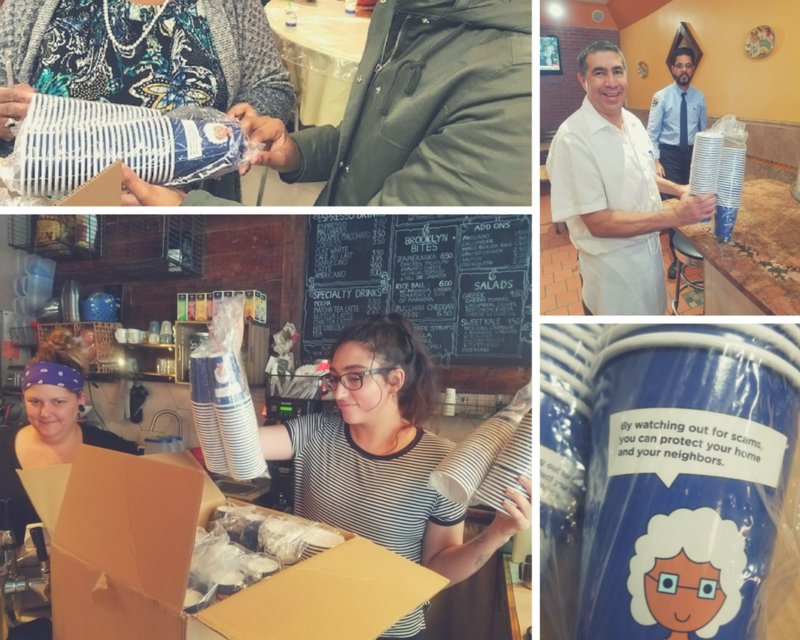 Coffee cups have already have been distributed by outreach partners to local bodegas, diners, cafes, and food courts. Many of the families were hardest-hit by the foreclosure crisis never really recovered, and are now facing an unprecedented housing affordability crisis. With thousands of New Yorkers struggling to making mortgage payments, swindlers have found it easy to target them for foreclosure rescue scams that charge high up-front fees or to steal their homes outright through deed theft. You can call her a senior citizen, but don’t call her vulnerable or naive. The New York State Attorney General’s Office has created a network of community-based legal and housing organizations that may be able to help homeowners get out of foreclosure and avoid scams. They don’t charge fees, and their only promise is to work hard on behalf of homeowners. Visit AGScamHelp.com or 1-855-HOME-456 to get connected to one of these organizations in your local community. Created by the AG’s office and the non-profit Center for NYC Neighborhoods, you can also use the tools at AGScamHelp.com to vet organizations you may have worked with.